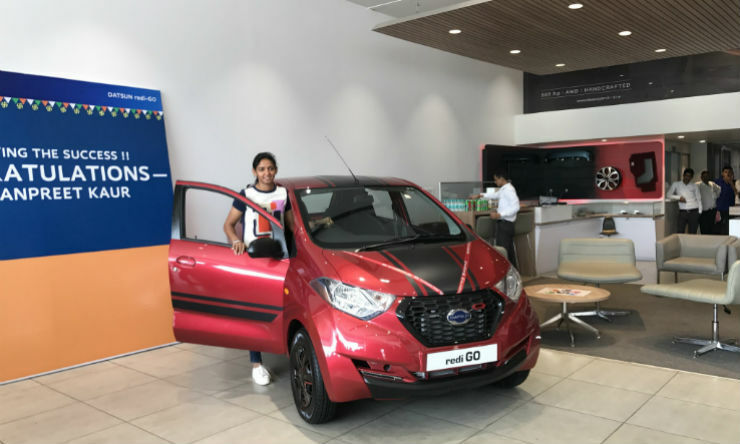 Datsun and Nissan have been in collaboration with ICC since 2015 and keeping that in mind, Datsun has given Harmanpreet Kaur a redi-GO. Harmanpreet is the vice captain of the Indian women’s cricket team and she just performed wonderfully at the ICC Women’s Championship Trophy 2017. She scored an unbeaten knock of 171 against Australia to take India into the finals. Datsun is working hard to help fuel the ambitions of India’s young achievers and risers. We are delighted to see women like Harmanpreet make the nation proud. We congratulate Harmanpreet for her understanding contribution during the ICC Women’s Championship Trophy 2017 and we are pleased to present her with the redi-GO for her sporting excellence. Thank You, Datsun India, for this gesture and I am looking forward to driving the redi-GO. This makes it easier for me to move around for training, but I am excited to take my family for a spin first. Datsun launched a new 1.0 liter version of the redi-GO just last month. The company now offers the redi-GO with 2 engine options, a 800 cc engine and the 1.0 liter engine. The 800 cc produces 53 Bhp and 72 Nm. The 1.0 liter engine on the other hand also produces 67 Bhp and 91 Nm. While the Renault Kwid shares the same engine, it comes with an AMT as well while the redi-GO only comes with a manual gearbox for the time being. The 1.0 comes in a total of two models, the T(O) and the top of the line S trim. The 800 cc on the other hand comes with 5 variants D,A, T, T(O), S.
Prices range from Rs 2.41 lakhs to Rs 3.72 lakhs ex-showroom.